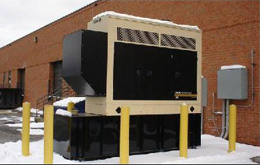 Imagine the disastrous consequences of a standby generator not starting up in your commercial or office building. This can happen very easily if the fuel in the tank is dirty and yet it’s also preventable. Under normal storage conditions, diesel fuel will remain in a useable condition for between six and twelve months, depending on the ambient temperature. Over time, stored fuel darkens and sediment forms that can clog filters and result in poor combustion. 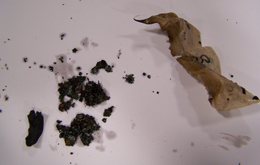 Carbon and soot deposits on injectors and other combustion surfaces can also cause serious problems. Bacterial or fungal growth such as algae can also occur, with a living slime blocking fuel filters. The various forms of algae all feed on fuel and live in water. Unfortunately, water is always an issue. The fuel tank has to be vented to the atmosphere and water appears as a result of condensation on the inner walls due to fluctuations in temperature because of the return fuel from the engine or external temperature changes. The majority of problems related to diesel engines are caused by poor fuel quality but usually result in expensive repairs and equipment that’s out of service. The removal and disposal of contaminated fuel and the purchasing of a new supply is certainly an option, but it’s an expensive one. 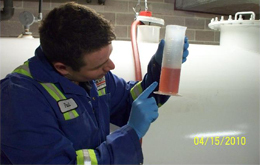 Fuel polishing allows you to recover, recycle and reuse diesel fuel cost effectively and is environmentally friendly. Fuel cleaning ensures trouble free operation of equipment and safeguards the integrity of your fuel, eliminating the need for expensive additives while reducing maintenance and disposal costs. The New West fuel cleaning process begins with a site assessment. Every tank is different, and presents its own unique challenges. 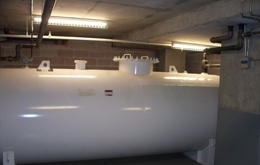 Tank and site access are determined, as well as any potential hazards that may be present. Before and after site photos are also taken, which allows us to ensure the cleanliness of the area and provides a record of the site for the next annual fuel cleaning. Alberta and national Canadian Fire Codes require an annual ‘swirl and bright’ test to determine fuel condition. The New West process takes this a step further, utilizing fuel testing in a laboratory environment, with the results of before and after cleaning provided to the customer. The CSA standards referenced in the Alberta and national Canadian Fire Codes call for filtering three times through a 20 micron filter with a water block. New West pre-filters the fuel through a purifier, utilizing a separation, coalescing and filtration process. This removes the larger contaminants and water. We then filter the fuel through a 30 micron filter with a water block, followed by a 20 micron process. A fuel stabilizer is then added, or a fuel stabilizer with a conditioner, depending on the location of the tank. The site is cleaned, ‘after’ photographs are taken and post-site inspection is performed. 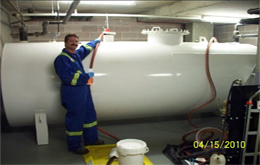 An inspection document is applied to the tank, detailing the last cleaning and next recommended scheduled cleaning. A New West unit number is assigned to the tank for the purposes of record keeping. 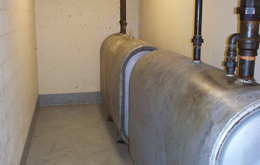 The Alberta and national Canadian Fire Codes also require that there is always documentation of the fuel cleaning. 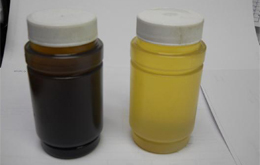 We provide this in a binder, detailing the cleaning process, the fire coded reference and the fuel’s laboratory results. A certificate is also issued detailing the codes and the date the cleaning was performed. When the failure of your diesel powered equipment is simply not an option, clean fuel has to be a top priority. A diesel engine won’t operate using fuel that is old or contaminated in some way. 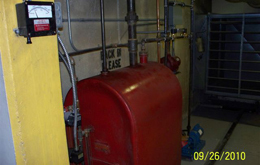 All fuel has a limited life that has to be taken into consideration in any maintenance program. 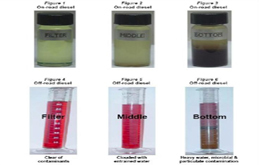 Problems with your diesel fuel can have serious effects on equipment reliability. Having your fuel cleaned and polished can make all the difference in determining whether your operation runs and stays running. 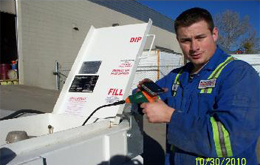 Don’t wait until it’s too late – call the fuel cleaning experts at New West Equipment.